While everyone’s been on then lookout for those big July 1 changes, Georgia – a state which has not updated any of its mandatory labor law notices since 2016 – slipped in under the radar with a summer surprise. With a revision date of 06/18, the Georgia Department of Labor has updated the Unemployment Insurance for Employees notice for the first time since 2013. The Georgia Unemployment Insurance for Employees notice informs employees that their job is covered by the Employment Security Law, describes eligibility requirements, and instructs employees on how to file a claim for unemployment insurance benefits. 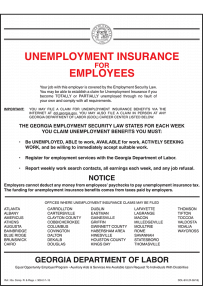 The bottom of the notice contains a complete list of locations for Georgia Department of Labor offices at which employees may file a claim for unemployment insurance benefits in person. The Georgia Unemployment Insurance notice has been revised in order to place more emphasis on an employee’s ability to file a claim for unemployment insurance benefits online. It now supplies the URL for the Georgia Department of Labor website, dol.georgia.gov, where employees can file an electronic claim for benefits. The list of locations for Georgia Department of Labor Career Centers has also been revised with obsolete locations removed and new locations added. If you already own one of Compliance Poster Company’s signature products, you can update with the quick and easy 2018 Georgia Unemployment Peel ‘N Post™ sticker for only $9.95. If you’re looking for a complete compliance solution or wish to be up-to-date on all major and minor changes, order the 2018 Georgia All-On-One™ Labor Law Poster, consolidating all state and federal required postings onto one convenient and attractive wall poster, or a Georgia Mobile Poster Pak™ booklet for mobile and off-site workers. Georgia products are available in both English and Spanish formats.